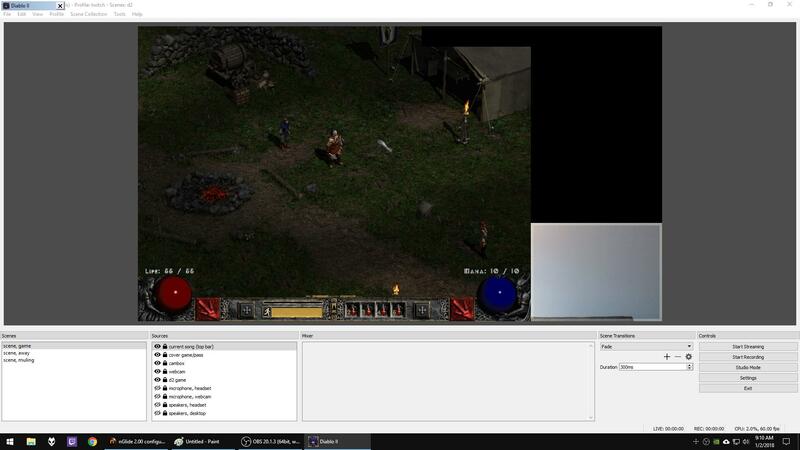 im trying to set up diablo 2 for streaming with obs but i'm running into a problem. after i minimize the game then click back into it, the game doesn't show. i just see a window in the upper-left corner and then everything on my desktop. the mouse acts as if the game is active though, so any action will be directed to the game. it may not happen on the first minimize/restore but it will eventually happen. i can't use the vulkan backend as it is not supported by obs. I cannot reproduce the problem. Tried to minimize/restore it more than 30 times and the problem never occured on my test configuration (gtx 960 + win10 1709 x64 + d2lod 1.13 + obs in the background). Tried pressing "LeftAlt+Tab" as an alternative or "LeftAlt+Enter" twice (nGlide windowed mode/fullscreen switch) when this happens? stuffedtiger wrote: i can't use the vulkan backend as it is not supported by obs. It's not supported in "Game capture" mode yet, but "Monitor capture" should work without an issue. i noticed the problem doesn't happen if obs isn't open. have you tried adding a "game capture" source and setting it to game.exe? i run d2 and also obs as admin. removed admin from d2lod and obs and i got the thing to happen again. alt+tabbing when this happens will minimize the game and then when i try to open it again the game will crash. using "game capture" to capture game.exe. the glitch happened and the d2 window was just a title bar. the video starts with d2 minimized. disregard the beginning... when the barbarian starts moving is when i restore the game (the d2 window remains just a title bar). after that i did leftalt+enter and what i saw was the game "windowed" and the black bars were transparent (i could see the sides of my desktop because i am using 4:3 aspect ratio in nglide settings), but obs saw the game stretched wide (probably because i have the game capture source set to "stretch to screen"). i pressed leftalt+enter again and the sides start glitching out (the video shows what i actually witnessed). pressed leftalt+enter again and the "windowed" bit happened again. video ends. After switching to game capture mode I was able to reproduce Alt+tab problem. The issue seems to be correlated with Win10 FCU fullscreen optimizations. Once you disable the feature with right clicking on game.exe alt+tabbing starts working exactly the same as on Win7 with OBS. Sometimes you will need to press Ctrl+Alt+Del -> Task Manager to minimize the game but it works every time. 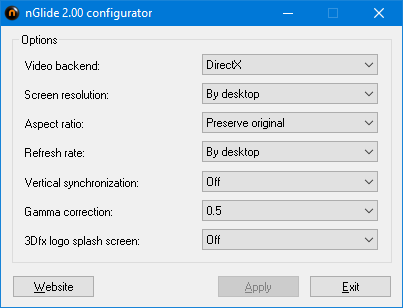 Black bars flicker and crash during loading screen with OBS was caused by nGlide's DX backend. Both problems will be fixed in the next release.